Lovelies, It's been a while we have a guest post right? Most of you have known her for her delicious, scrumptious meals, running through our Facebook and google+ new feeds. Plus, this is her second time doing a guest post for us. She decided to give us a delicious sweet treats for us this time :). Since Diwali is around the corner, she thought Indian sweets would be a perfect time for the guest post. I couldn't agree more with her. As most of us know that Diwali is also known as "festival of lights".. This is the moment you get delicious sweet treats, yes, I love this..so many sweet treats! Shazana is a dear friend and I simply love her blog and the recipes she has to share. Her baking goodies are so tempting and delicious and wish I could learn more from her. This is the second time I'm guest blogging for her and thank her to give this opportunity. Navratri and Diwali is round the corner and when Shazana asked me to guest blog, I decided to make some sweet for the occasion. Navratri and Diwali are the biggest and most popular festivals in India and any festival is incomplete without sweets and desserts :) .. So, sharing a step-wise recipe to make some beetroot coconut Burfi to start the festivities. 1) Grease a square plate with ghee and keep it aside. 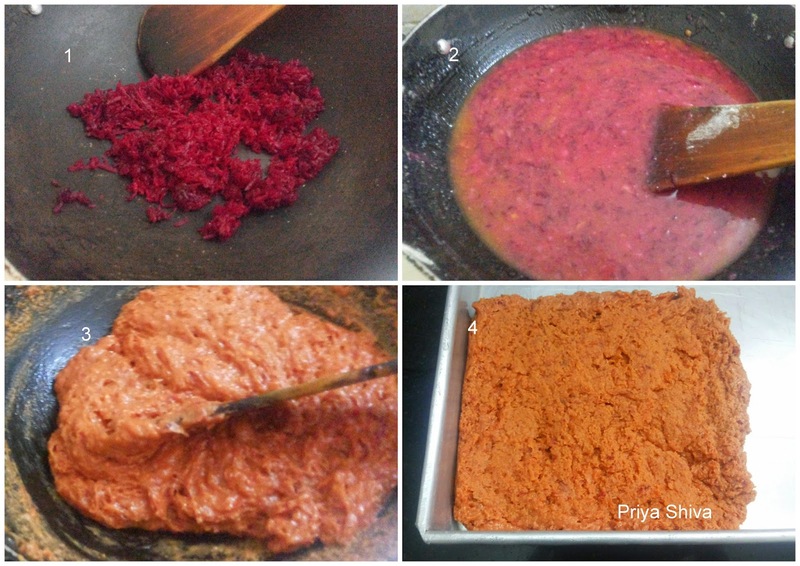 2) Saute grated beetroot for a few minutes in a pan so that the raw smell leaves from it. 3) Add all ingredients in a heavy bottom pan and mix it well to ensure there are no lumps. 4) Place the pan on the gas stove on low flame and stir continuously for a few minutes. 5) Now you'll start seeing it bubbling and ghee leaving on the sides. Add cardamom powder and when it starts becoming like a dough, transfer the content into the ghee greased plate and leave it for a few minutes. When it is still warm, cut it into square pieces and when it cools down keep it in an airtight container. 1) Always sieve the gram flour before using it for sweets. 2) Use non-stick pan for making sweet so that it does not stick at the bottom. yup its so delicious plus, healthy I think its a must try! Thank you priya for have time to write on our blog :) It was indeed a nice delicious treats. Wow.. Lovely guest post ladies.. The beetroot coconut burfi looks delish..